The St Sava Cathedral community, once again this year, celebrated Easter Services with the hierarchy, clergy and faithful of the Russian Orthodox Cathedral of the Theotokos of the Sign in Upper Manhattan. 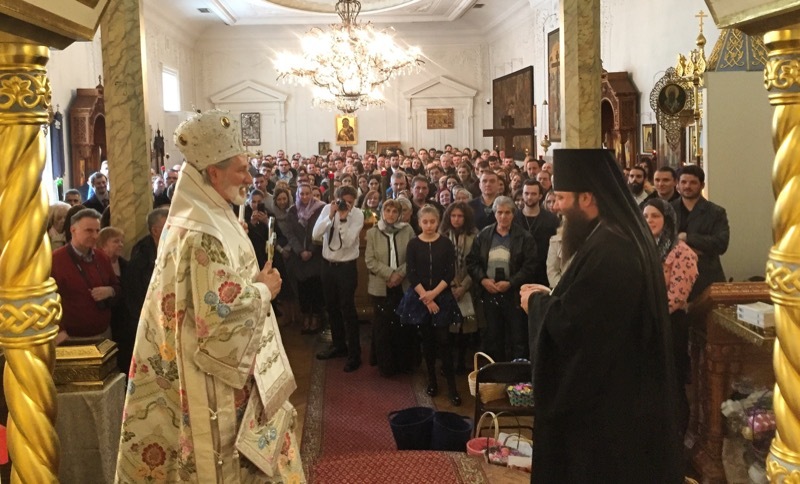 Concelebrating at Resurrectional Matins were His Eminence Metropolitan Hilarion, First Hierarch of the Russian Orthodox Church Outside of Russia, and Their Graces Bishop Irinej of Eastern America and Bishop Nikolai of Manhattan (ROCOR). Joining them, among the other clergy, were Fr. Zivojin Jakovljevic, Dean of the St Sava Cathedral, together with Protodeacon Milos Zdralic, Diocesan Financial Secretary, and Deacon Jovan Anicic, Diocesan Education Director. The following morning, His Grace Bishop Irinej led the celebration of the Paschal Hierarchical Divine Liturgy for the Serbian community. Joining the concelebrating clergy was Fr. Aleksa Micich. During the Festal Liturgy, His Grace elevated Deacon Jovan to the rank of Protodeacon in recognition of his many accomplishments in the field of Orthodox Christian and Serbian Cultural Education in the Diocese. 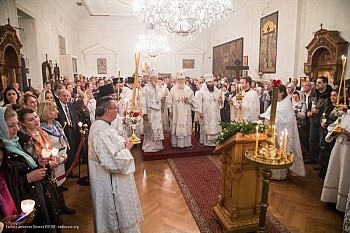 At the conclusion of the Divine Liturgy, His Grace Bishop Nikolai welcomed all on behalf of Metropolitan Hilarion and the Russian clergy and faithful, noting that although they join us in anticipation of the restoration of the Cathedral, the feeling is bittersweet as the common services that we share at Pascha will be missed. Following the dismissal, everyone joined together in fellowship for the Easter Sunday Agape meal donated by this year’s sponsors for the St. Sava Patronal Celebration, Zvezdan and Jovanka Radosavljevic, prepared by the Serbian Cultural Club and served by the Holy Protection Cathedral Circle of Serbian Sisters. Though our New York City Community is still without its beautiful temple and thereby home, which is being rebuilt, our community is neither forgotten nor abandoned. It is precisely in such situations that the filial love of our Orthodox brethren truly comes through radiantly, embracing us in our time of need. In like manner, Holy Week services were concelebrated, with the blessings of Archbishop Demetrios, together with Fr Athanasios Demos and the faithful of the St. Eleftherios Greek Orthodox Church in Midtown Manhattan. May the Risen Lord richly reward them for their generosity of heart and spirit! His Grace Bishop Irinej brought great joy to our Serbian faithful in announcing that we had finally acquired permission from the Landmarks Commission to proceed with the reconstruction of the roof and floor of our burned, but ever glorious Cathedral. In tandem with this phase, the windows and doorways will be temporarily enclosed. It is anticipated that this work will be well under way by late June. Our collective love, prayers and donations are needed in order to resurrect our Cathedral, once designated as the Pro-Cathedral of the Serbian Orthodox Church in the USA and Canada, together with her community to its former glory, and to the greater Glory of God!